My husband and I found these on the way to a friends' campsite. My mother taught me as a child which ones were good to eat, but these are my favorite. 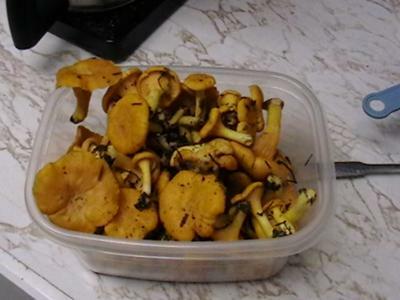 As a relative newcommer to mushroom hunting I would say I enjoy the Chanterelle the most. Maybe because here in my part Ohio they come up later in the summer when much of the undergtowth has gone and they are easy to find. But have walked enough acres of woods to realize they are not everywhere. Finding mostly Smooth chanterelle variety but some Golden and even a few Red. Have only found Black Trumpets one time and they were very small. I have found mushroom hunting to be the best stress reliever except for the occasional spider web in the face. I have found cooking them up with a little onion and adding to spaghetti sauce over Angel Hair pasta to be quite satisfying. Join in and write your own page! It's easy to do. How? Simply click here to return to Chanterelles.